The chef at the U.S. Embassy in Moscow gives her recipe for the holiday’s centerpiece. In 1620, in a story that is familiar to all American schoolchildren, Europeans landed in the area of what today is Plymouth, in Massachusetts, and settled there. The Pequot Indians helped them survive the first, most difficult winter by showing them what they could eat in this new strange world. The next fall, after the immigrants, they asked the Indians to join them for a feast, which became Thanksgiving. According to legend, the main dish at that meal – and the focus of the Thanksgiving table today – is roast turkey. The native Americans called this bird “ferky,” and it was found in abundance in the forests of North America. It became the main dish not only for Thanksgiving, but also for Christmas and sometimes Easter. The reason for this is not just that turkey tastes good. There were also economic considerations: slaughtering a cow would be a serious blow to a family with a small farm; chickens were needed for their eggs and deer had to be hunted. Turkeys, on the other hand, were readily available and also easy to breed. They are not picky about their food and they grow rapidly. Benjamin Franklin famously regretted not having the turkey rather than the bald eagle as the national symbol of the United States. In a letter to his daughter Sarah, he compared the moral qualities of the eagles and the turkey, blaming the eagle for its laziness and praising the turkey for its bravery in protecting its offspring. 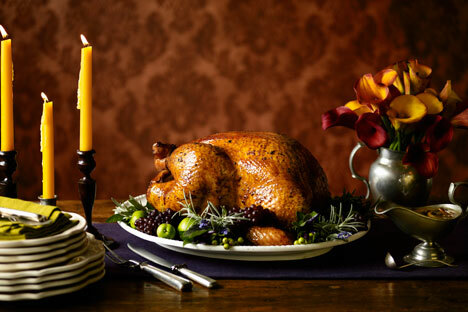 According to the U.S. Department of Agriculture, 45 million turkeys are eaten on Thanksgiving in the United States. But turkey is not such a common food in Russia, so some instructions are in order. When choosing a holiday turkey, the bird’s skin should be of a uniform light color, and its trunk should be solid and supple. A marinade based on water and citrus or apple juice can prevent the meat from becoming dry. Salt plays the main role - it retains moisture. Since most people choose large turkeys for the holiday, the bird needs to be well marinated. Depending on size, a turkey should be cooked between three and seven hours. This cooking time is due to the meat’s density and the hardness of the bones. It is most convenient to cook the turkey on a roasting pan with a V-shaped grill. This allows excess fat to drain into the pan and for easy adjustment of the bird’s position by slowly turning it while it is baking, thereby evenly distributing the heat. For accompanying dishes, there are as many variations as there are families. For stuffing, popular options are bread-based, using either white or corn bread flavored with nuts and spices, sausages and cabbage with fennel, potatoes with and pork and offal, mushrooms or vegetables with herbs, and oysters. Nor is there any no consensus about the cooking method for the stuffing. Some believe it should be cooked inside the turkey, others - from the outside. Flavor can be added to the festive dish by using two sauces - gravy and cranberry. The meat gravy is intended to emphasize the bird’ rich taste. Cranberry sauce can be both liquid, and solid as jelly, but always sweet. It plays on the contrast of textures and flavors. At a gathering with family and friends, the Americans forget about time: Thanksgiving dinner means long conversations over a big plate of food. The year is coming to an end and there is no reason to hurry. 1. Combine all the ingredients, stir until salt and sugar dissolve. Bring to the boil, turn the heat off and cover with a lid. Cool. Put the turkey in the marinade and refrigerate overnight. Before baking, keep it in cold water for 15 minutes and then dry it. 2. Preheat the oven to 200 degrees. Chop the vegetables coarsely, to put half of them inside the turkey spread out the remaining vegetables around the roasting pan. Firmly tie the turkey’s legs with a coarse thread, take it under the bird, and tie it swings on its chest. Grease the grill with sunflower oil and place it on the roasting pan. Place the turkey on the grill with the breast facing upwards. Spread the melted butter on top. Pour a glass of water (235 ml) into the roasting pan and cook the turkey for 45 minutes. 3. Pour the juice accumulated in the pan over the turkey, and add another cup of water. Bake for another 1 hour 45 minutes, pouring the juice on top every half an hour while turning it a quarter turn. Add another half a cup of water. The turkey is ready if the meat thermometer shows 76 degrees when inserted into the bird around the thigh area. Let stand for 20 minutes before cutting. 4. Break the cornbread into pieces and leave to dry overnight. Fry the bacon in 100 g of oil for 10 minutes, remove the bacon, place the medium sized cut slices of onion, shallots, and celery together with sage and thyme into the pan. Simmer on low heat for 25 minutes, until the vegetables are soft. Mix the bread with vegetables and nuts, add 50 g of melted butter, eggs, and a glass of chicken broth. Season with salt, pepper, and mix. Remove the mixture and place it into a greased mould, cover with foil and bake for an hour at 175 degrees. Remove the foil and add half a cup of broth. In 10 minutes time, pour the remaining broth and bake for another 20 minutes. Serve the stuffing as a side dish. First published in Russian in Vokrug Sveta magazine. How is the stuffing for the turkey cooked? I bake it separately. This way it turns out tastier and is quicker to make. However, my grandmother is sure that the filling should be cooked inside. After she puts the pan in the oven, she generally prefers not to think about it for three hours. I flip the turkey and pour juice on top; it turns out juicier that way. What else do you cook [to go with the turkey]? Sweet potatoes with butter and sage, brussel sprouts with bacon and balsamic vinegar, beans with mushroom sauce and crispy onion, buns with a browned crust and a soft core. Anything you like! Apple pie, pumpkin and vanilla ice cream, cake with nuts, dried fruit and bourbon. Is there a festive Russian dish that you like? My sister-in-law cooks a lovely Russian salad. I do not eat this salad if it is made by someone else, because it is difficult to make it really tasty.